Chicken is one of the easiest, inexpensive and most convenient dishes in a family’s culinary repertoire. Roasted, baked, sautéed, broiled, grilled or fried, you likely already have a favorite chicken recipe or two up your sleeve. Perhaps you’re one of the lucky ones who learned how to make these simple poultry classics from your mom or grandmother, or even an uncle or father who happened to know his way around the kitchen. But in case you’re not, or even if you are but you still like to try new variations on these recipes, today we’re going to teach you how to prepare two of our favorites. With Our Favorite Southern Fried Chicken you’ll sink your teeth into flavor filled drumsticks that are as juicy as they are crispy. And with our Southern Grilled Chicken, you’ll savor rich pepper glazed poultry that cooks up great on the grill or on the stove. We’re making chicken two ways, today on Jathan & Heather! Before we get started, we’re going to tell you a little tip that saves us time and money every time we make chicken. We love dark meat when we eat poultry, and if you do too, you should know that your butcher probably sells thighs and drumsticks already packaged together. If so, you’ll want to get a 5-pound bag or carton (and if you want the whole chicken, just buy the 5-pound equivalent, whole or cut up). Now that you have that handy, we’re going to brine the poultry. 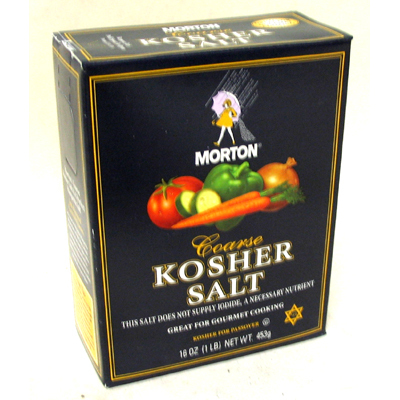 Kosher salt dissolves easily in water to make a basic brine that creates succulent poultry. In case you don’t know, brining is an important step in preparing truly fabulous poultry. Brining changes the consistency of your poultry, making it more fibrous and porous, which is a good thing. This allows your chicken to retain moisture as it cooks so by the time you serve it on the table, it is still juicy and oh-so-delicious! So let’s begin. Now for those of you who have brined poultry before, you may have seen a more complex method than what we’ll use here, but you really don’t have to. Our method is quick and simple, and has the same effect as other recipes that tell you to use multiple herbs. In a large stock pot, combine 6 quarts water and 2 tablespoons salt; add chicken. Cover and chill for 8 hours or overnight. Drain chicken; rinse with cold water, and pat dry. Step three? There is no step three. Brining is that simple! Our Favorite Southern Fried Chicken is juicy, zesty, crispy and delicious. 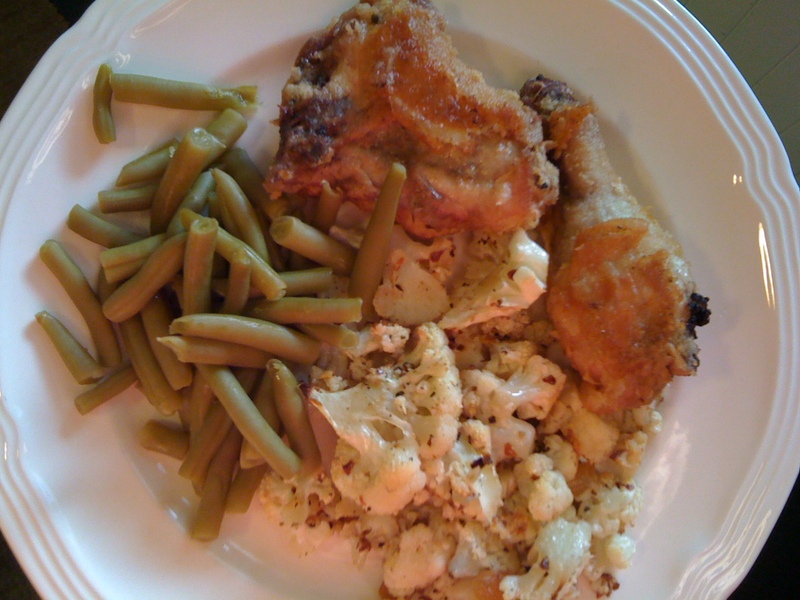 Here we've served it with sides of Spicy Roasted Cauliflower with Golden Raisins and Sautéed Green Beans. Combine salt, pepper, cayenne and flour in a large heavy-duty zip-top plastic bag. Place 2 pieces of chicken in bag; seal. Shake to coat. Remove chicken; repeat procedure with remaining chicken, 2 pieces at a time. Combine oil and bacon drippings in a 12-inch cast-iron skillet, heat to 360° or until a few water droplets dance on the oil when shaken from your fingertips into the pan. Add chicken, a few pieces at a time, skin side down. Cover and cook 6 minutes; uncover and cook 9 minutes. Turn pieces; cover and cook 6 minutes. Uncover and cook 9 minutes, turning pieces during the last 3 minutes for even browning, if necessary. Drain on paper towels; keep warm. TIP: For best results, keep the oil temperature between 300° to 325°. Pepper glazed Southern Barbecued Chicken is great off the grill or cooked atop the stove. Try serving it with Baked Beans, Cole Slaw and Corn Bread. In a large saucepan, combine the first eight ingredients. Bring to a boil; stirring constantly. Reduce heat; simmer, uncovered, for 10 minutes, stirring often. Cool. Pour 1-2/3 cups marinade into a large heavy-duty zip-top plastic bag; add the chicken. Seal bag and turn to coat; refrigerate overnight, turning occasionally. Cover and refrigerate remaining marinade for basting. If cooking on a grill, prepare grill for indirect heat, using a drip pan. 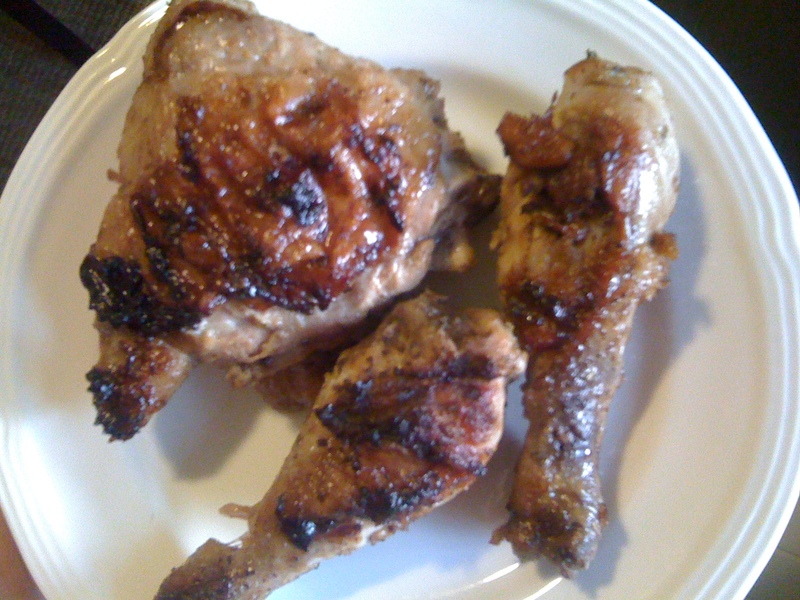 Drain and discard marinade from chicken. Place skin side down over pan. Grill, covered, over indirect medium heat for 20 – 25 minutes on each side or until juices run clear, basting occasionally with reserved marinade. If cooking on the stove, heat a cast-iron grill pan until pan is hot and water droplets sizzle on the surface. Drain and discard marinade from chicken. Place skin side down over pan. Grill, covered, over medium heat for 20 minutes on each side or until juices run clear. Do not baste as bottom of pan will fill juices from the poultry.